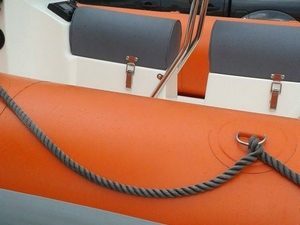 With a superb quality range of marine grade materials, fabrics and foams we have the necessary experience and technical knowledge to custom build any custom upholstery for your vessel. From rowing boat cushions to full interior and sleeping quarter refits we have over 35 years experience in producing high quality and professional marine upholstery. We can provide a full or partial refit service to replace all or part of your vessels interior upholstery. 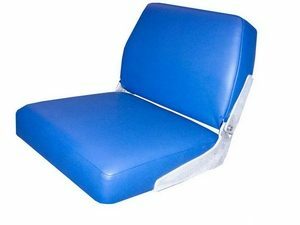 Including replacement of cushions, seating, mattresses, sidelining and headlining, covers, recovering of existing foams, new foams and small or large refurbishments, all with the highest quality materials. You can provide your own fabrics that you have purchased elsewhere or choose from our vast range of marine grades. We can provide samples of materials used in our upholstery. We can produce upholstery from drawings, templates or the originals. All our upholstery is accurate of a high quality and can be fitted yourself or we can do it for you. We can copy originals to suit your existing interior or completely redesign for a new look. 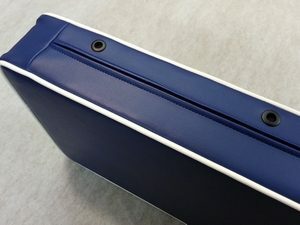 We can replace all your headlinings and sidelinings with our range of materials to suit your choice or we can replace with original fabrics as long as they are still available. We can custom build from new or provide a refurbishment service for all your existing seats, cushions, covers, linings and mattresses. We use only the best quality materials and workmanship to give you quality you can be proud of. 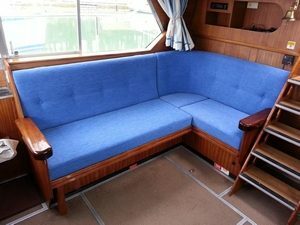 We can replace or refurbish your vessel’s exterior, foredeck, helm and cockpit cushions with a wide range of quality materials and foams for long lasting quality. We stock a wide range of quality marine grade foams for refilling and can also recover your existing foams if you would prefer. 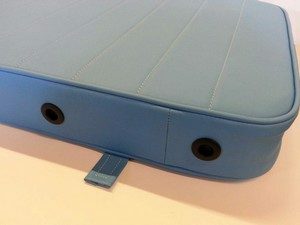 Custom cushions and rests can also be made to your measurements using high quality foam or closed cell to prevent water ingress. Cushions can be fitted with zips and breathable vents for ease of maintenance and to prevent damp from destroying the core. We have a wide range of fabrics and foams in stock to custom manufacture, refurbish or replace your existing interior cushions. All custom made to suit and fit well into your vessels interior. We can also refurbish or replace your existing bunks, berths and mattresses to a high standard. 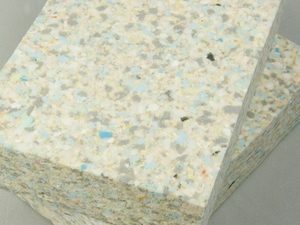 We have in stock or can source a wide range of materials for coverings. All materials are proven in a marine environment. We can replace or completely refurbish your yacht or boats sleeping quarters, from a small one off upholstery repair to a complete refit. 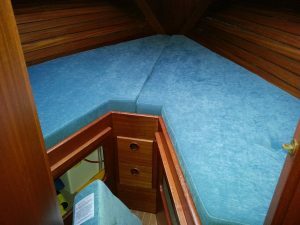 We can recover existing foams, supply new covers, repair upholstery damage, refill cushions, mattresses and bunks with high quality foams, completely redesign your sleeping areas or provide materials for your marine upholstery project. If you have composite or wooden seating in your cockpit you will know how uncomfortable it can be after prolonged periods at the helm. We provide a tailored cockpit cushion and helm seating service, with custom design and build to suit your cockpit or complement existing exterior and interior furnishings. A good quality cockpit cushion for your seating and those of your guests will add to the enjoyment providing much needed comfort. We can supply a wide range of materials and high quality foams and even create composite foam interiors from differing grades to provide exactly the feel you are after. Many modern vessels are quite a bit larger than older yachts, boats and power boats and there is an area of unused space on deck that can be put to good use. 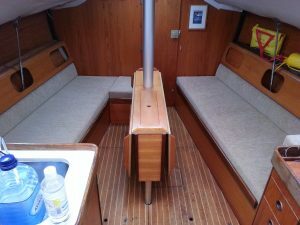 We can provide a service to custom build cushions for use on deck, aft and foredeck areas, giving useful and comfortable environments for you and your guests to relax. All our cushions are designed to be long lasting in a marine environment and we use only the best UK sourced materials and foams expertly crafted on our Suffolk premises for your satisfaction. 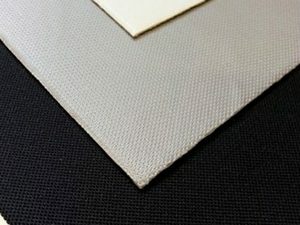 We have in stock and can supply a vast range of quality foams of all sizes and grades, fabrics, upholstery sundries, threads and cottons, coverings, upholstery tools and adhesives, sailcloth, vinyls, webbings, polyester wraps, mattresses, cushions, baize and other upholstery supplies for your DIY fitment or repairs. All our upholstery supplies are UK manufactured and are of the utmost quality. We only sell the supplies we are happy to use ourselves.